Photo from the video of the girl being yanked into water by a sea lion. A waterfront community of people in British Columbia is blaming people for the incident in which a child was pulled from the water by a sea lion. Over the long weekend, there was a sea lion that pulled a little girl into the water but she was saved, bystanders. The video that was posted almost everywhere online, shows an adult sea lion yanking a child into the water. It is believed that the child should not have been on the ledge but it seems to be a standing debate with many people across the world. 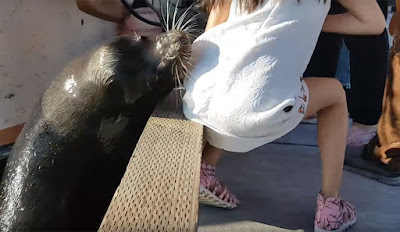 The sea lion grabbed the back of the girl’s dress. However, the events that occurred just after this were amazing. A bystander almost immediately jumped into the water to save the child from possible death. The little girl did in fact, get a form of a wound from the ordeal. A Vancouver Aquarium spokesperson said in an email that the family of the victim has contacted the facility and is getting the superficial wound treated with the proper medical attention. Smoke Attwood lives in Steveson Village and says that people need to stop feeding the wildlife. Attwood said he confronted a family that was posing for a photo with the animal. They also had their child in the same position on the guard rail as the girl in the video. The family was posing next to a warning sign about sea lions. Two other residents Donald Walker and his wife Shirley said they walk the dock every week. He said that it would be hard to prevent people from feeding the wildlife unless the harbor authorities started issuing fines for it. I personally think that people should heed the warning of signs. There is a reason after all why the signs are in place. The thing is when you see a sign at the very least just respect it. Everyone should know by now not to feed the wildlife of areas with warnings. Incidents like this one are the reason signs are up. It is a preventative measure, please keep your children away from the edge of rails when warning signs are in place. If you want to feed animals go to a different location, preferably one that does not have a sign telling you to be careful.